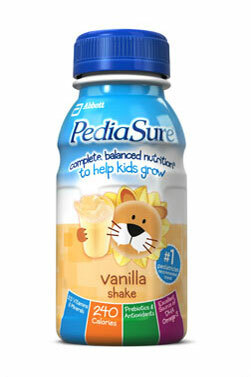 My son drinks PediaSure® every morning for breakfast. It’s full of nutrients and our pediatrician recommended it. He calls it his Teddy-BaBa*. He’s always been a super picky eater (the opposite of me) so this is a way for him to get his vitamins every day that he might not willingly get otherwise. They come in packages of six (occasionally for under ten bucks if you know where to shop), and Sebo is well aware of this. We ran out of them yesterday and bought more last night. This morning we broke one out of the pack for him. He took it, drank it, and then told me “we still have six.” I said back to him “no, there are only five now.” “NO we still have six!” he said. I picked up the package and walked over to him. “Okay, how about you count them?” He pointed his finger at each one: “One … Two … Three … Four … Six!” He giggled and said again “We still have six.” And he was right. He had taken number five apparently. This is my son. * When we first started buying them, there was a teddy bear on the packaging, and he used to call bottles BaBas, and thus Teddy BaBa was invented.